(2009). A Simple One-Dimensional Model for Investigation of Heat and Mass Transfer Effects on Removal Efficiency of Particulate Matters in a Venturi Scrubber. Iranian Journal of Chemical Engineering(IJChE), 6(4), 3-14.
. "A Simple One-Dimensional Model for Investigation of Heat and Mass Transfer Effects on Removal Efficiency of Particulate Matters in a Venturi Scrubber". 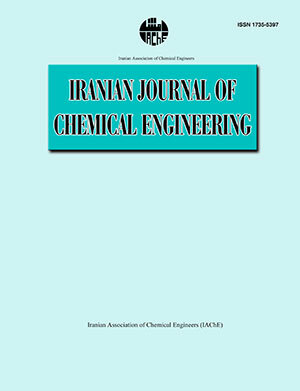 Iranian Journal of Chemical Engineering(IJChE), 6, 4, 2009, 3-14. (2009). 'A Simple One-Dimensional Model for Investigation of Heat and Mass Transfer Effects on Removal Efficiency of Particulate Matters in a Venturi Scrubber', Iranian Journal of Chemical Engineering(IJChE), 6(4), pp. 3-14. A Simple One-Dimensional Model for Investigation of Heat and Mass Transfer Effects on Removal Efficiency of Particulate Matters in a Venturi Scrubber. Iranian Journal of Chemical Engineering(IJChE), 2009; 6(4): 3-14. In the present study a mathematical model is developed in order to examine the effects of heat and mass transfers on removal efficiency of particulate matters in venturi type scrubbers. The governing equations including the variations of the particulate concentration, gas temperature, droplet temperature, diameter, and velocity are obtained based on the conservation laws and are solved numerically. In order to validate the model, necessary data was measured and collected in a commercial cement plant that uses these types of scrubbers in air pollution control applications. A good agreement between plant data and the model predictions is noticed in general. The results obtained from the model reveal that the existance of temperature difference between the gas and the liquid droplets decreases the overall removal efficiency of particulate matters. This is due to sudden reduction ofrelative velocity between the gas and droplets which is resulted from the existence ofheat and mass transfers between the two fluids, especially in the throat section. In addition, the effects ofvarious operating parameters on the extent ofreduction in the removal efficiency are examined. This study confirms that in most industrial applications ofventuri scrubbers it is necessary to use a direct or an indirect cooling tower in order to decrease the gas temperature before entering the venturi.